A balloon-carried telescope is airborne, built to study star formation. Riding high altitude winds, the Balloon-borne Large-Aperture Sub-millimeter Telescope (BLAST) departed a ground site in Sweden on June 12, destined for five to seven days of flight. It is scheduled to land near the border between Canada and Alaska. The huge balloon was launched from Esrange, the Aerospace Operation Facility of the Swedish Space Corporation, departing from a launch "pad" the size of 40 soccer fields. Weighing nearly 3-tons, the telescope is to reach some 25 miles (40 kilometres) altitude in its sky-high look at stars and other objects. The telescope structure includes a 6 foot (2 meter) in diameter primary mirror. The balloon carrying BLAST is some 460 feet (140 meters) in diameter and roughly 395 feet (120 meters) tall. BLAST has been sent aloft to address some of the most important cosmological and galactic questions regarding the formation and evolution of stars, galaxies and clusters, said Mark Devlin, the principal investigator of BLAST from the University of Pennsylvania. The effort is also testing technology headed for future use in the Herschel telescope, a sub-millimeter space telescope to be launched in 2007. The balloon/telescope campaign is sponsored by NASA. 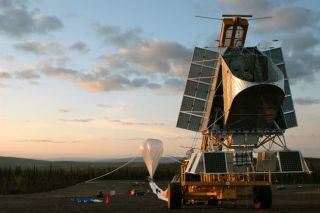 The operation will be supported by The National Scientific Balloon Facility in cooperation with the Swedish Space Corporation (SSC) balloon team at Esrange. Among a number of duties, BLAST will look at star formation rates of high-redshift starburst galaxies; measure cold pre-stellar sources associated with the earliest stages of star and planet formation; and observe solar system objects including planets, large asteroids, and trans-Neptunian objects. During its week-long flight from Esrange to North-western Canada, the stratospheric facility will have a combination of sensitivity, spectral coverage and angular resolution unmatched by any facility in the world. There were several attempts to launch the BLAST payload earlier this month. But due to wind conditions, liftoff operations were cancelled. BLAST is now headed across the Atlantic from Sweden to Alaska. Never before has such a flight been made, given payload weight, altitude to be reached, duration of the mission, and its flight trajectory. Global Positioning System satellite data shows the whereabouts of BLAST.